MUMBAI: Mumbai’s famous dabbawallas rushed to feed the farmers as they walked into the elite city. Ordinary citizens gathered with water and snacks for the peasants who had undertaken a 200 km journey from Nasik to Mumbai to the Chief Ministers doorsteps in a bid to make the government finally heed their demands, and recognise their distress. The welcome was warm, with the hitherto silent Congress and Shiv Sena rushing to support the KisanLongMarch organised by the CPI(M)’s All India Kisan Sabha. No one seemed to notice, or even care, that the CPI(M) sickle covered Mumbai on this day. Carried aloft by thousands of poor peasants at the bottom end of even the distressed agrarian chain.Mumbai and Azad maidan where the march converged, was turned into a sea of red. Sections of the media predictably tried to reduce the march to a Left organised show, but were pushed aside by the stoic peasants who really did not care for the media’s response, and Mumbai’s own enthusiastic welcome. .Reporters approaching the farmers looked for the usual ‘we do not know why we are here’ response that does mark political rallies often. And were clearly surprised to find that every single farmer they spoke to knew why he or she was there. A woman who had fainted said she did not care, she was here, she was happy to add her voice to those demanding a piece of land. And would rather die marching for her rights than go back home at this stage.An elderly farmer who had joined the march mid way, made light of the 100 odd kilometres he had walked, saying this was part of the struggle for rights. A woman sat trying to repair her run down chappals. Groups of young men sat in orderly rows, waiting for some food and water. The discipline maintained through the 200 km was admirable. They walked in orderly rows. They stayed in open fields.. They followed the organisers directions. There was no scramble for water or food. Most had been asked to carry their own food, with the All India Kisan Sabha trying to supplement the meagre meals along the way. There was no jostling, no rushing, just camaraderie and after a long while a feeling of optimism that their march would not be in waste. The farmers, in tens of thousands, trooped into Mumbai in the early hours of the morning, before the city had woken up. AIKS that had earlier expected a crack down by the government had instructed the farmers to stop when stopped, and sit down. The Fadnavis government, however, realised that the numbers were too big, and the response overwhelming despite the initial blackout by the big media. Word then was sent out to the organisers to keep peace, and to meet with the Chief Minister for the realisation of the list of demands, foremost being loan waivers and remunerative prices. The farmers were greeted with enthusiasm by Mumbai, that clearly was sensitive to their plight. And very supportive.The national media had little choice, given the peoples reaction, to arrive with their cameras and lights and report the event. While some channels decided to question the ‘politics; behind the march, others went with the decision of fair reportage. More so as the farmers with their serious faces, and honest responses, made it clear that for them this was a life and death march. A middle aged woman farmer with bleeding feet refused to be left behind, and continued with the long trek that symbolised the commitment and the farmers resolve. There was a strange kind of confidence. And irreverence that was apparent in their comments about the BJP government, their optimism of getting their due, their indifference to the media that, as a young farmer said, “has never bothered with us”, their visible poverty not being a shackle but clearly a weapon for action. There was no sense of victimhood, but of justice and rights. No desperation, despite the distress. The Modi government has remained indifferent to their plight, and as AIKS leader Ashok Dhawale told The Citizen earlier, the centre has left it to the cash strapped states to dole out the finances, when actually the Modi government should budget for loan waivers and remunerative prices.” Fadnavis had earlier accepted the demands when the farmers had intensified their agitation last year, but as Dhawale said the promises remain in the air. This time AIKS is not willing to call off the agitation without concrete measures, and not just assurances. The farmers are not going to move now until the government concedes the demands. And AIKS is satisfied with the response. The gherao of the Assembly remains on the cards, with the farmers waiting for instructions to move in their formidable numbers to the state Assembly. The government has realised that it will have to use force—batons, watercanons, tear gas—on those who feed the rest of India. And clearly is worried about the repercussions in Maharashtra and other parts of India. For the farmers, there is no religion. They are the poor and the deprived, who have faced endless discrimination by the ruling classes despite committing suicide, despite standing in water for days, despite coming to Delhi and drinking their own urine along with other measures. Interestingly the violence against the farmers and labourers in Tripura has ignited the protest in Maharashtra. At the very beginning kisan leaders addressing the meeting said that they were also marching in solidarity with their comrades in Tripura, where the BJP brought down statues of Lenin and attacked the homes and offices of CPI(M) workers. That ‘farmers and workers’ have been attacked in Tripura has had a resonance amongst the more aware in the March. Mumbaikars in Solidarity with the Farmers: Jai Ho! MUMBAI: “The Kisan March from Nashik to Mumbai is a high visibility step in mobilising our people who feed the nation . There have been in the past two years many similar mobilisations in the Capital and encircling Delhi largely ignored by the media and the well heeled gentry living off the sweat and tears of the aam admi . The Tamil Nadu Farmers wore skulls and bones on their bodies . Such a demonstration is unheard of anywhere in the world over hundreds of years and yet the Ruling class could not care less.The Acche Din are now perceived by many in the media too to be a hoax and a fraud, cheating our simple people…perhaps for this reason and the highly imaginative peaceful protests in Rajasthan the Journalists woke up as the Kisan march to the financial capital of India, as they may have felt threatened. The impact is symbolised by the words of an elderly, frail woman on the March who fell down exhausted/ fainted and got up to be asked by a media person if she will now return to her Village ….She said with glowing eyes and anger perhaps ‘ NO ! If I go the Village I will die there ….I will march on and die if I must on this March ,our march to end this starvation , misery and exploitation. That says it all ! 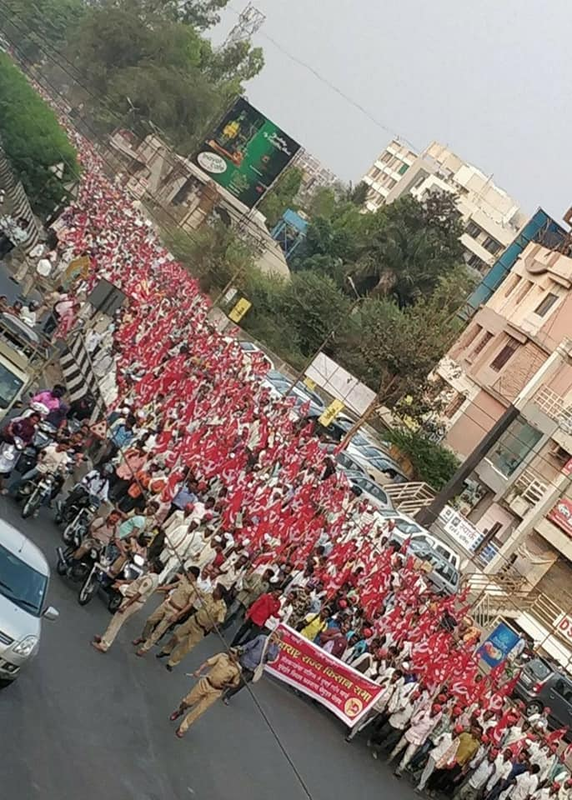 The Citizen Bureau adds: Below are Snapshots–in video and still– of the #KisanLongMarch from Nasik to Mumbai capturing the mood and the determination of India’s farmers. Far from being able to stop the upsurge Maharashtra Chief Minister Devendra Fadnavis is scrambling to meet an All India Kisan Sabha delegation, probably this afternoon.